Save your sunglasses by using our sunglass lenses replacement service. You can replace non-prescription lenses or make your favorite sunglasses into prescription sunglasses. Save your sunglasses from the garbage by using our sunglass lens replacement service. You can replace non-prescription lenses or make your favorite sunglasses into prescription sunglasses. Just send us your sunglasses today and we will install brand new lenses of your choice. We work on all designer sunglasses! 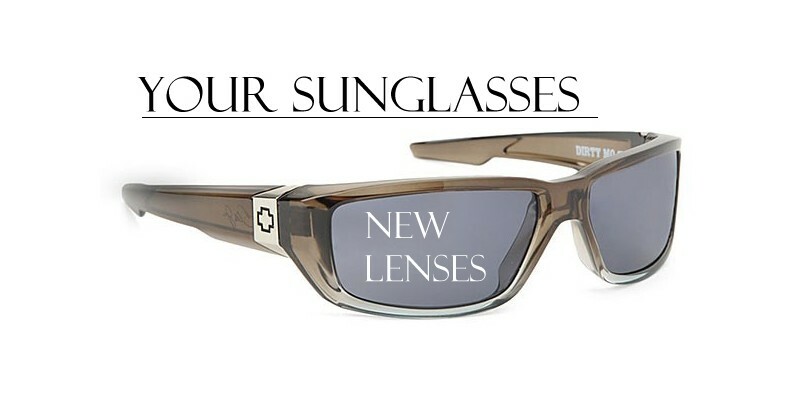 Our sunglass lens replacement service includes a wide array of options. If you choose non-prescription lenses, we will install standard plastic lenses similar to OEM lenses from the manufacturer. If your original lenses are of higher quality than standard plastic, we will contact you and let you know. If you choose this sunglass lens replacement service for prescription lenses, you will be pleasantly surprised to know that we only use HD Digital Polycarbonate and HD Digital 1.67 Lenses. They are similar to the OEM lenses manufactured by Oakley©. These digital lenses that come with this sunglass lens replacement package are available from non curved lenses to the most extreme curved lenses (wrap-around). 1) Just click the "Add To Cart" button above and select the lenses you would like for your sunglasses. 2) Make a payment using your credit card, paypal, check or money order. That's it! Our professional opticians will take apart your sunglasses, cut and install new lenses and ship everything back to you with either your old case or a new case and cleaning cloth. For more details on lens prices and to receive a free custom quote on your lenses simply click Purchase This Item below. We understand that you want to pay the best price on the Sunglass Lenses Replacement Service. We will do our very best to price match any authorized store, online or offline. Contact our customer support team for more information.